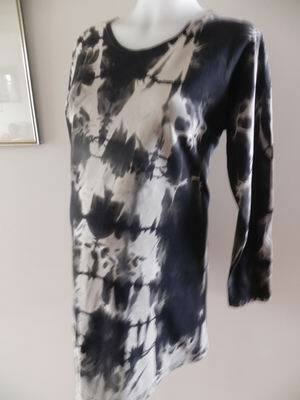 A lovely funky print, this black with cream tie dyed top looks great with our leggings. The top is in gently preloved condition, by Belly Basics, in size large. It is a cotton elastane blend, very soft with plenty of stretch. The top has long sleeves and is a longer style in an a-line fit, with small splits at each side seam. Be the first to review “Black Tie Dye Style Maternity Top” Click here to cancel reply.